Everyone has a magic cape! New year, new start, unfortunately not much new technoglogy to keep up with all those Jones’ out there, but I just might get this blog back on tract, and if so, it just may have bit of a different breeze to it. ALOT has happened in 2011, and some of that may come forth. I’m no longer in NC, I’m actually back up Spokane, WA where I spent about five years of my childhood youth. Let’s face it, I’m a city girl, Spokane just ain’t doing it for me, Seattle or Portland here I come as soon as I win the lotto or don’t have humongous outstanding medical bills I have to keep paying off. Anyway, everyone has their own sob story I’m sure. The one thing I would like to see through is the blogging pants because they are more than just jeans to me, they are more than just affirmations, they are more than just a nuisance. I know I don’t have a cape to change to the world, let alone in the aspect of medical care, but especially in January where everyone is knee deep in trying to lose weight, what about the 1 in 5 people dying of eating disorders. Oh no, we can’t talk about that, it’s not socially acceptable. It is actually the number one killer above all else but because it is usually classified from organ failure, heart attack etc, it gets shuffled under the rug, and we turn our minds to socially more acceptable things to talk about like heart disease and diabetes. Sorry, minor soap box. Anyway, the blogging pants have slowly been moving around for about a year, gaining affirmations and I truly thank everyone who participated and who still will. I’m hoping to get them back by the first week of February for the NEDA conference where the theme is “Don’t be defined by your GENES,” but we will see. It has been inspiring to me to find so many out there that are so positive about themselves, honest, full of integrity, and honor their values over their waste size. The strength and paths women have traveled is mind-blowing. I guess I should start sewing some super–women outifts! -the following all shown in favor bags, different fun things, etc..
A bundle of more/visual food ideas…. A few decorations and more food…. 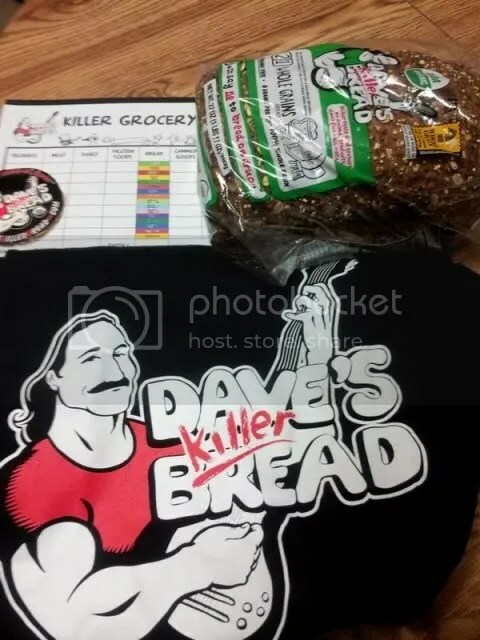 First off, I was in no means bribed or paid to write any of this, although I have been a very grateful recipient of Dave’s Killer Bread in the past, but let me tell you, it changed my life…in numerous ways! I was lucky enough to first try DKB when he sent me some even though I was living in boon-dock North Carolina, and my world was changed. It was not available in NC, so I had to keep bribing my Seattle living sibling to keep sending me some. I had not eaten bread forever, and he brought it back into my life. It was the perfect texture, taste, and the ingredient list is nothing but amazing making me feel good about what I was putting into my body. His loaves are hearty, real, good-wholesome food! I am now back in the PNW and can keep my own stock-and yes, even though I’m on a very tight budget and some might scoff at the price tag, it is worth every penny. 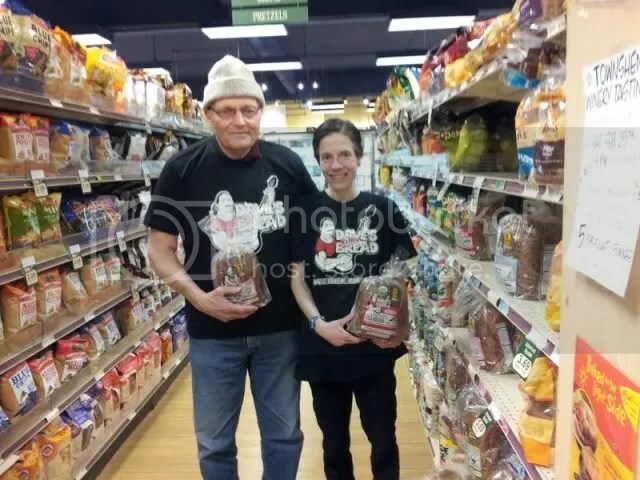 My “Grandpa J” who was very set in his old ways would never spend anything over 99c for a loaf, and we now regularly make costco trips-guess you can change an old cowboy after all! We savor every bite! Thanks again for making such a great impact in everything you do and helping make my Grandpa’s 75th a memorable one, he was smiling ear to ear. (Now we have to go blow out his Sin Dawg candles)!!!! I know I know….I’m a terrible blogger….but honestly, it’s not one of those dog ate my computer things and I’m not going to bore you with a lifestory saga. To simply sum things up, the journey of life has been a very rocky road right now, I don’t have regular computer usage or internet connection, nor any of the other fancy gadgets that seem to make a cool blog that keeps readers coming back. A very good friend, even though I’m vegetarian and was creeped out at first, has been teaching me a quickly disappearing art of leathercraft. It’s a pretty cool craft, and after the creepiness, it was the history and meaning that you could give to other people that kept me going, plus all of the time and care that goes into it. I have been making things, mostly from old scraps, that I hope to be able to sell for pennies to donate to NAMI, NEDA, and the CANCER ALLIANCE. We can basically make just about anything and are slowly building a site, but the flickr site is constantly updated…. 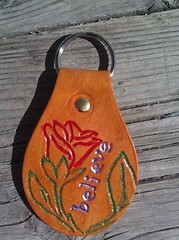 If you are interested, check us out at JB LeatherHandcrafts! I’ve also been sewing…ummm…or trying to and just taking one day at a time. However, more importantly, the BLOG PANTS are on the move again!!! 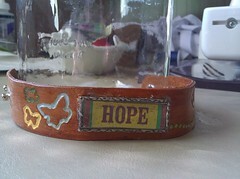 My goal is to get them ready for the NEDA conference this fall so let’s get them going and filled!! You ladies have been awesome about this and it could not have happened without you, so THANK YOU! Word on the blog world is that Neverhomemaker has sent them off to SavvyJulie…so stay tuned! Let’s Get the Blog Pants back on Track!! I know I haven’t been around much and I do apologize…first I lost internet, then the very poor computer I had pooped out, so I have 2 brief times a week I am able to get to a computer decent enough for me to blog on, hopefully this will change soon though. 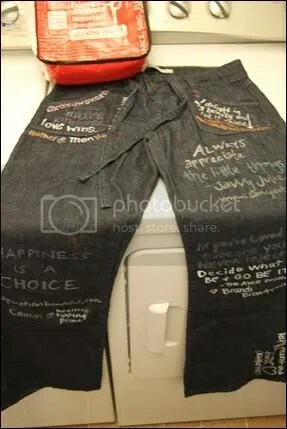 Anyway, remember the blog pants? They were being sent from blogger to blogger collecting affirmations. My goal is to really get them going around at a faster pace and get them covered in time for the NEDA conference which is being held in October. So my dear friends, I know you have some powerful words to share, let’s get these pants flying again so your wisdom can be shared with some wisdom and inspiration from a group of women who could greatly benefit. Okay, I have to come clean about a few things. One, I’m addicted to diet soda. Two, I use Splenda, Truvia when I can afford it, but hey, I’m on a budget. Three, I hate water. I don’t mind carbonated water, which I also drink, but I hate just plain flat water. This is where Crystal Lite Pure comes to the rescue. 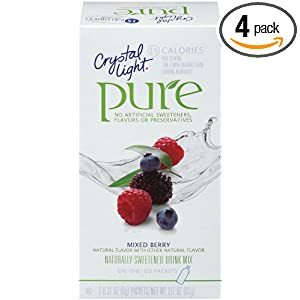 I have been trying to lessen my artificial sweetner intake, and Kraft was kind enough to send me three of the Pure flavors to try out, my favorite was definitely the GRAPE! yes, i know this is mixed berry, it's good too! The individual packs are easy to carry around, and provide solid flavor in my 320z nalgene bottle. I still mix it with a little bubbly (be it 1/2 lemon lime, or 1/2 plain sparkling water) but it is definitely a much better compromise. It comes in three flavors, grape, mixed berry, and strawberry kiwi…but I’m sticking with the grape! There is no funny aftertaste and seeing as I’ve never even been a juice/koolaid/lemonade/ice tea person before, I give this two thumbs up. Very refreshing and portable just in time for summer! The great people over at laptop lunches sent me the Dual Compartment Bento Kit 2.0 to try out since I’m constantly on the go with my snacks and reusing containers in an effort to be eco-friendly. I have to say, this thing was like a gift from the gods. The bottom portion of the bag held the bento kit that can be arranged in various ways to fit fruits, veggies, sandwiches, entrees, and even has a little cup for dressing so your salad won’t get soggy, as well as silverware that is simple to wash and clean. All of the containers are BPA free and made with recycled content! Another great thing is the kit comes a long with a book that explains healthy nutrition and shares some fun recipes and ideas for your bento kit. They have a ton of different varieties and versions you can check out at their site. These ladies obviously know what they are doing, are very resourceful, and have put out a great line of products that I would definitely recommend!